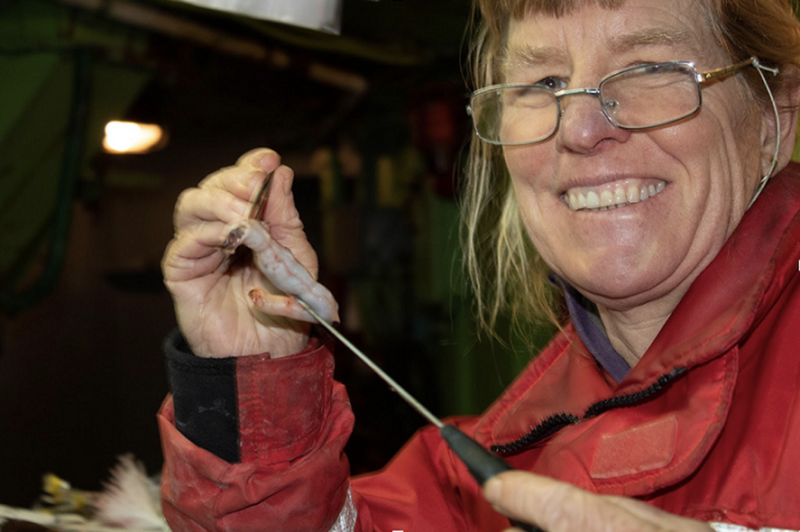 by Sage Van Wing Follow OPB March 26, 2019 noon | Updated: March 27, 2019 8:35 a.m.
Laurie Weitkamp examining the stomach contents of a chum salmon. Where do salmon from Oregon’s rivers and coast go when they swim off into the open ocean? A scientist from Newport just returned from a month aboard a Russian fishing boat trying to answer that question. Laurie Weitkamp is a biologist for the National Oceanic and Atmospheric Administration. We talk with peer support specialists who are uniquely qualified to help people struggling with either addiction or mental health issues because they’ve dealt with those same issues themselves. Braunwynn Franklin is a peer and wellness manager at Cascadia Behavioral Healthcare. O’Nesha Cochran is a peer support specialist in OHSU’s Project IMPACT. Researchers at Oregon State University recently found crabs feeding at deep methane vents in the ocean. The crabs were eating bacteria that fed on the methane, meaning they were part of a lifecycle that didn’t need the sun for energy. In a quickly changing ocean, what are the impacts of another food source for ocean life? Andrew Thurber is an assistant professor of Oceanography and Microbiology at OSU.